- A basket of folded slips on which the multiplication tables are written. - A box of loose tablets containing the results of all the multiplications. Show the child the material and have him bring it to the table. Have him place his right index finger on the blue five at the top of the board. Have him place his left index finger on the red 4 on the side of the board. Have him run his right finger down and his left finger to the right until the two fingers meet. Have him write the answer on the piece of paper. Have him place the slip into the empty basket and repeat by choosing slips from the slip basket. The child can then check his work with Charts 1 or 2. The child can continue as shown in the presentation. At some point, he should do all of the slips. Have the child place his right index finger on the 3 and his left index finger on the 10. Have the child move his right index finger out as far as it can go and his left index finger out the same amount. Have him slid his right index finger down to meet his left index finger. Have him write the answer and read the whole equation. Have him place the slip in the empty basket and repeat in this way. Have the child bring the material over to the table. Have the child place his right index finger on the blue 9 and his left index finger on the red 9. As in Presentation 1, move the fingers to meet. Hold the spot with your left index finger and using your right hand, place the correct tile on the spot. If the child does not know one of the answers, he can check using other materials as well as Chart 3. 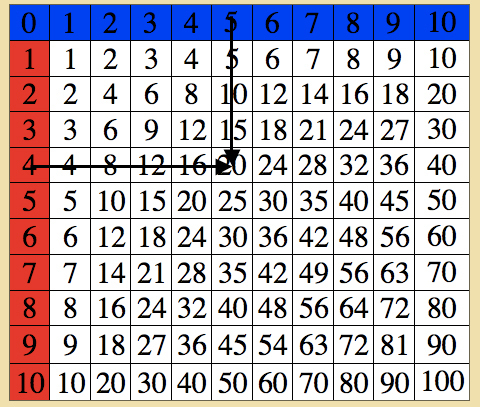 The memorization of the tables in multiplication. The various charts give the possibility of repetition, which helps to fix these in the memory of the child.